I never leave a show without browsing through the G. T. Luscombe booth. 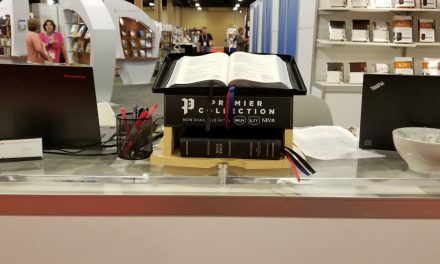 This booth is filled with Bible marking goodies. It includes pens, pencils, markers, highlighters, rulers, magnifiers, ribbons, tabs, covers, and much more. 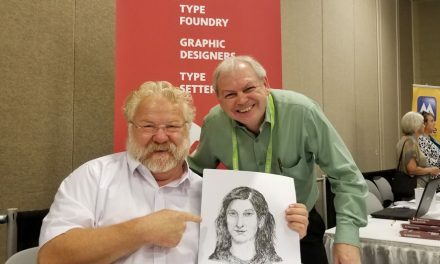 This time I got to interview John Luscombe, and I got him to share his marking tips and show his newest products. I’ll be reviewing many of these soon. One of the new highlighters is a twist-up crayon-style highlighter called Accu-Dry Bible Brights. They come in lots of colors. You can buy them individually or in a set of 8. They won’t bleed through and they’re self-sharpening. John demonstrates the difference between a wet and dry highlighter and explains the difference between show-through and bleed-through. All of their highlights are designed to not bleed through, but they will show through thin paper just like the text from the other side does. 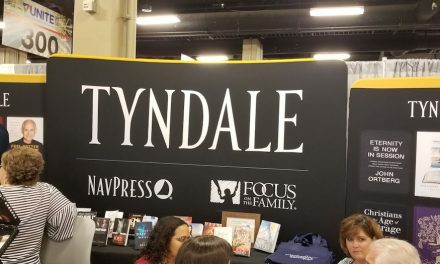 This is normal for thin Bible paper. John also demonstrates a Zebrite; discussing how pigment inks work and what archival quality means. John shows us a Sakura set called Pen Favorites. This kit includes the 4 best-selling pens and a ruler. The pens include an 005 (ultra-fine) in black, an 01 (fine point), an 05 (medium point), and an 08 (bold). He also shows what each one is best used for. Another set called Sarasa includes 12 pens with 0.8mm fine-point tips. It’s more affordable than most sets at $23.99, which is the same price as an 8-piece set of Micron markers and they look the same, so you really do get a lot for the money. One of the things I like about the packaging of the highlighters is they include a color-code. This is the personal color-code of John Luscombe and it’s an excellent code to get you started with Bible marking. Another product that’s new for GT Luscumbe is a bullet journal. They’re available in Typhany Blue, burgundy, and black. They include two ribbons, a pouch, and a pen holder. They retail for $9.99. This is amazing considering the most journals are around $25. John demonstrates the bullet journal and gives some tips on how to use it. You can learn more about bullet journaling at bulletjournal.com. I’m extremely impressed with GT Luscombe’s products and their prices are unbelievably low for their quality. I highly recommend them. You can learn more about GT Luscombe at gtluscombe.com. You can purchase GT Luscombe products at Amazon and many other retailers. You can see the video interview below (and yes, I know that color isn’t really chartreuse 🙂 ).